"...The Imperial Double Express was the "cover girl" on "Airgun World" vol. 10 no. 9, April 1987. There was also a one-page article, two-page centerfold photo, and a full-page ad from The Airgun Centre in Rayleigh featuring the gun (price: 550 pounds). The Double Express was designed to give two shots at about 10 fpe apiece, from only 10 pumps. It has the appearance of an over-under shotgun, but the lower tube is the pump tube of course, the shot tubes are side-by-side in the upper tube. It was intended to be available in .177, .22, or .25 per the customer's choice; two calibers in one gun was do-able. Each barrel was controlled by a separate trigger, and adjustable for zeroing at any desired distance. Power was adjustable as in all multi-pumps. 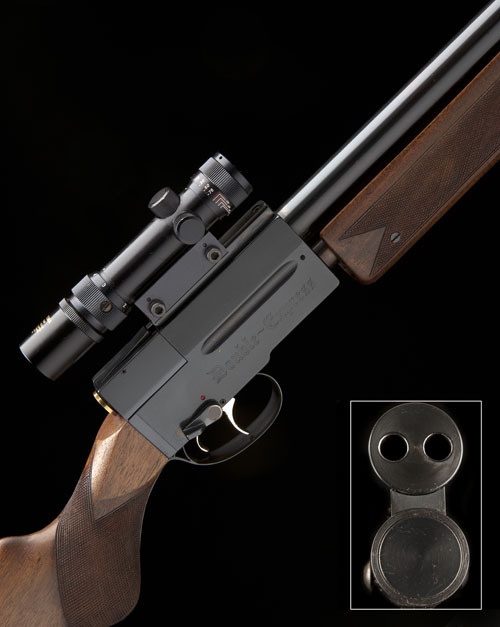 The breech design was very unusual, a single lever opening the pivoting breech for loading, and then a large brass button sizing both pellets on their way into the chamber. It had a safety. The gun was reportedly well-balanced and weighed only 7 pounds without scope. No open sights were provided..."
Between writing this post and posting it the gun didn't sell so I got an email telling me it was in the un-sold lots an available for £2,500. Nice very nice, but not for me.